f The Bugbytes: Navratri - the nine nights - "Golu"
South Indians celebrate Navratri - meaning nine nights by keeping "Golu". Long ago a war was waged for 9 nights- good over evil where good personified as Godess Durga won. 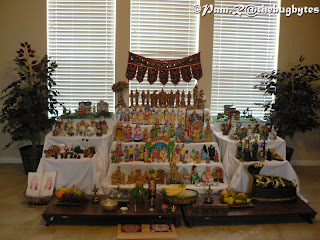 So in celebration of the colorful and rich life made possible by this event we can either keep it simple by just keeping a couple of idols of Gods/Goddess on the altar or do it in a grand fashion and arrange lots of dolls (all of them need not be idols of god/godess) on steps We call this as keeping "Golu"
This year I kept the steps/altar and called in friends. 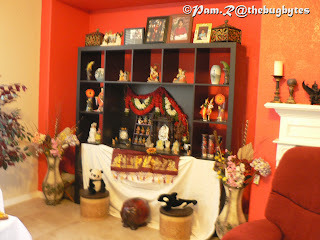 Here are a couple of pictures of the "Golu"